For a tasty kick, squeeze on fresh lemon juice or try adding a little "shot of hot" sauce as you enjoy any of the savory morsels in this great summertime classic recipe. In an 11- quart stockpot, combine the potatoes, TOPS Smoked Sausage, onion, beer (if you prefer, you may substitute clam juice for lager beer), Old Bay Seasoning, salt and pepper. Add just enough water to cover the potatoes. 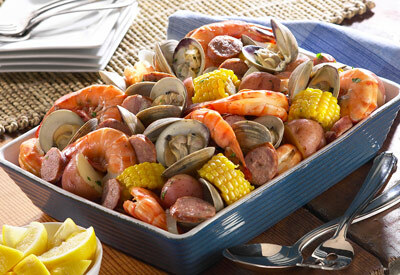 Add the corn, shrimp and clams in layers. Transfer to a large platter and serve with the baguette and melted butter for dipping. Soak clams in mixture of 1/3 cup salt to 1 gallon water for 20 minutes to help clear out the salt and sand inside. Once they've soaked, scrub the clam shells to remove any barnacles or other debris.